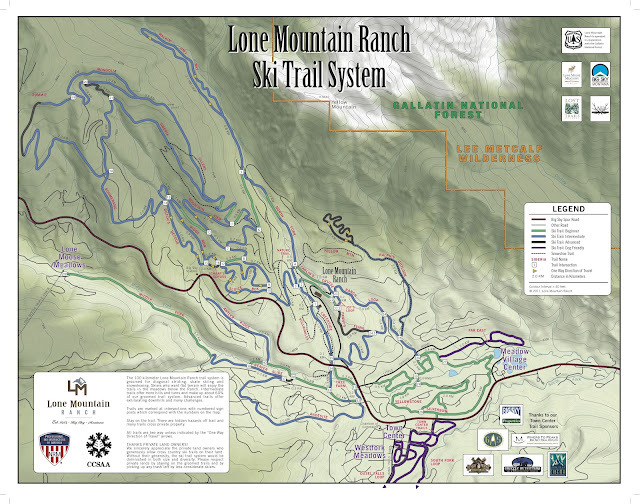 Lone Mountain Ranch is a cross country ski resort with 80 km of trails. Naturally, a lot of my free time is devoted to skiing the trails. I realized the other day people reading this might find it interesting to know a little bit about the trails around here, so here is a trail map for you all to check out, complete with contour lines with elevation. Note that the elevation difference between the highest trail on the map, Mongolia, and the lowest one, Far East, is 2000 vertical feet. To put that in perspective, the tallest ski hill in Michigan has a vertical of 900 feet, Mt. Bohemia ski resort. How ridiculous is it that there are "Black Diamond" cross country ski trails? I think it is hilarious. But really, they are pretty tough! It is really easy to completely bite it on one of them. We are talking steep hills with a straight up s-curve right in the middle of them, or a 90° turn at the bottom over a creek. Miss that turn and you are in the drink. Love it. Talking about ridiculous, I can ski into town for errands. So cool. Yesterday I skied down to the Meadow Village Center, had a beer at the brewery, then picked up some groceries and skied back. Only in Montana. As of now I have done about three quarters of the trails, hitting up all of the major ones. There are still a couple like Andesite and Far East that I have not yet made time for. That will come. The ranch also has a "K Club" to keep track of your distance and as a friendly competition between employees. Right now I have around 180-200 ks maybe? I hope to get 400 by the time the season is done.